Where the River Esk reaches the North Sea, after crossing the uplands of North Yorkshire, the ancient seaport and the modern holiday resort of Whitby has grown to a town of some 14,000+ inhabitants. The east side, with its narrow winding streets and fishermen's cottages surmounted by the Abbey (originally founded 657 A.D.) is perhaps more steeped in history than the relatively modern west side. The town is rightly proud of its association with famous men and its close and continuing links with the sea which show the development and natural decline of such industries as whaling, shipbuilding, sailmaking and ropemaking, all of which brought much prosperity to Whitby in their hey-day. It is impossible to elaborate on the historical detail and customs of the town in so short a space, but one tradition still carried on in Whitby may be of particular interest. This is the Planting of the Penny Hedge. The ceremony takes place yearly on the morning of Ascension Eve, at approximately 9 o'clock and dates from 1159. It is said that Norman noblemen killed a hermit who had given sanctuary to a wounded wild boar they were hunting. Dying, the hermit was said to have forgiven them – but the Abbot of Whitby ordered that, as a penance, they should erect a hedge every year on the mud of Whitby harbour, using a penny knife, or forfeit their lands. Since then, the penance has been faithfully carried out. This is but one of many interesting incidents in Whitby's history. Of more lasting implication was the 'Synod of Whitby'. It was in Whitby that monks representing the Celtic Church, and those accepting the rule of Rome, met in 664 A.D. to discuss variations in Church custom and practice, notably methods of fixing the date of Easter. The system they agreed upon is the one in use today. At this time, Whitby was the home of Caedmon, (often called the father of English sacred song) an illiterate labourer, who was employed as cowherd and porter at the Abbey. Caedmon had a vision in which he had presented to him great quantities of remarkable poetry. The Abbess, Lady Hild, ordered that it should all be written down. Centuries later the many cantos of Caedmon's Anglo Saxon religious verse were still being sung in Northern England and they exercised great influence on later English poets, especially Milton. More than 1,000 years later, when Whitby had become an important whaling centre, James Cook (1728-1779) born in the village of Marton, near Middlesbrough, and formerly apprenticed to a draper in Staithes, 11 miles north, was apprenticed to a local shipping firm. The house where he lodged with his master can be seen in Grape Lane. Later, he joined the Royal Navy and was rapidly promoted to a command. It is as Captain Cook that the world still knows him – the man who charted the coast of New Zealand and the eastern coast of Australia and who was one of the greatest surveyors as well as one of the finest sailors and explorers of all time. He learned his craft in Whitby vessels trading to the Baltic, and two of the vessels he used on his long and perilous voyages – 'Resolution' and 'Endeavour' were Whitby built. 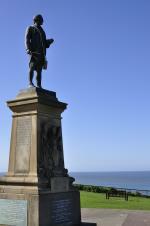 A bronze statue of the famous circumnavigator was erected on the West cliff and unveiled by Admiral Lord Charles Beresford on 2 October 1912. The bi-centenary of Captain Cook's sailing on his first circumnavigation was celebrated in Whitby in August 1968 when a plaque of commemoration was unveiled by the High Commissioners of Australia and New Zealand. Two other remarkable but less known Whitby navigators, the William Scoresby's, father and son, added greatly to seafaring knowledge. Their interest was primarily in whaling, but they made careful observations of Arctic phenomena and invented several nautical instruments. The father (1760-1829) pushed further through the pack ice in 1806 than anyone had before; and Scoresby Land, in east Greenland, and Scoresby Sound, are named after the son. Whitby offers the visitor more than history; its situacation is superb in the middle of one of Britain's most delightful stretches of coast, with cliffs and fine bays interspersed with picturesque fishing villages. The noble Abbey may be a beautiful ruin, but the Parish Church of St Mary, dating partly from 1110, and reached by 199 steps cut in the cliff, is still very much a part of the town.